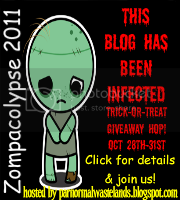 Goldilox and the Three Weres: Zompacolypse 2011 Giveaway Hop! Welcome to my little piece of the Zompacolypse 2011! Check out my giveaways (US only) and enter on the Rafflecoptor from below. Then check out the linky for all the other blogs participating! I will pick TWO WINNERS. The first winner will get their choice of the two books, and the other winner will get the other book. Enter below and then check out the other giveaways! Could you delete my entry please? Awesome giveaway, and a BIG, HUGE thanks from me & Greta @ Paranormal Wastelands for participating in Zompacolypse 2011!! Hope your having fun and join us again next year;) Also don't forget to enter yourself to win the giftcard is you stumble upon a bonus stop! I have been wanting to read Anna Dressed in Blood! Thanks for the chance to win a copy. Apocalypse of the Dead looks awesome! Great picks! Thanks for being a part of the hop! Ohhh..zombies. I haven't read a good zombie book in a while ;) Thanks for the giveaway! Very cool giveaway. I am anxious to read Anna Dressed in Blood. I am hearing such good things about it. "Inside the Outside" by Martin Lastrapes and "The Z Word" by Bella Street!! !